MAY 12, 2018 – Reliant Yachts of Newport, Rhode Island announced today a new build under contract for a 40’ tender utilizing the X series platform. 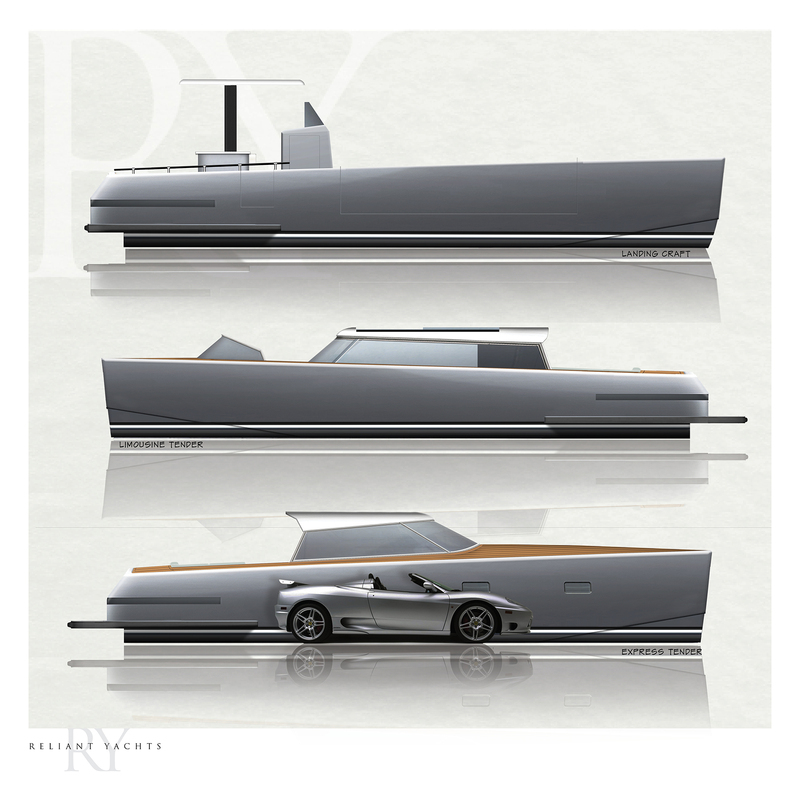 Ewing continues, “The X40L is many things: superyacht luxury tender, car carrier, utility vehicle, landing craft, dining tender, scuba platform, water disco, floating galley, and jet boat … and I probably have left something out. The design was in collaboration with a client with specific and clear requirements for this boat, and I don’t believe we would have developed a design such as this without the creative push from our client”. 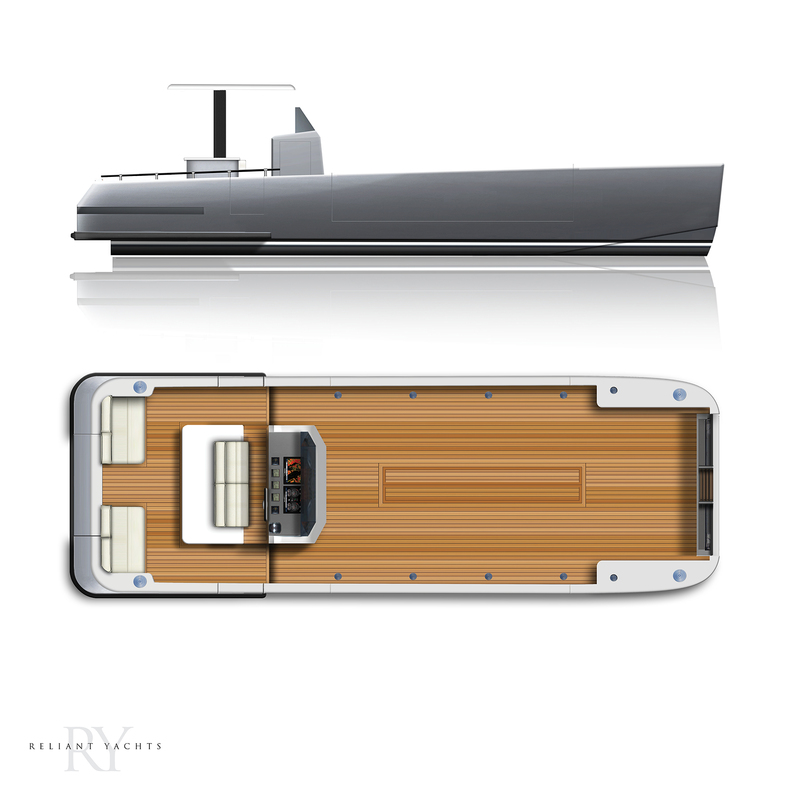 The X40L was initially conceived as a luxury utility tender to move things back and forth easily from a superyacht to shore, including an SUV. That included the ability to beach the craft and drive (the SUV) onto shore, which required both aluminum hull construction and a shallow draft/jet engine configuration suitable for beaching the forward section of the boat. The X40L has a hydraulically-powered front door with a built-in ramp for driving off and on. Superyachts are, of course, the ultimate in luxury, but what they can’t always do is get close to shore. 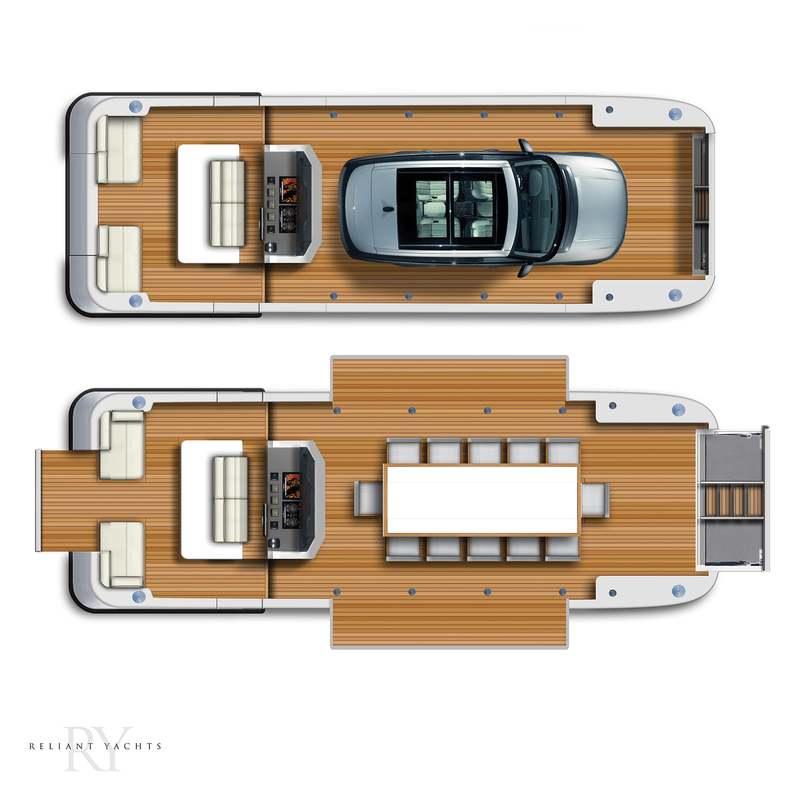 The X40L is small enough (in the superyacht sense) to stow in a garage where the shallow draft and jets come in handy for keeping the vertical footprint (height) at a minimum, yet large enough to take a party as large as 14 close to (or onto) a deserted island to party. A large flat platform was required to stow a car, so to utilize the space in “entertainment mode,” a push of the button raises a dining table out of the sole to accommodate 14 people for a sit-down dinner. A large removable canopy covers the dining area to keep the sun off. 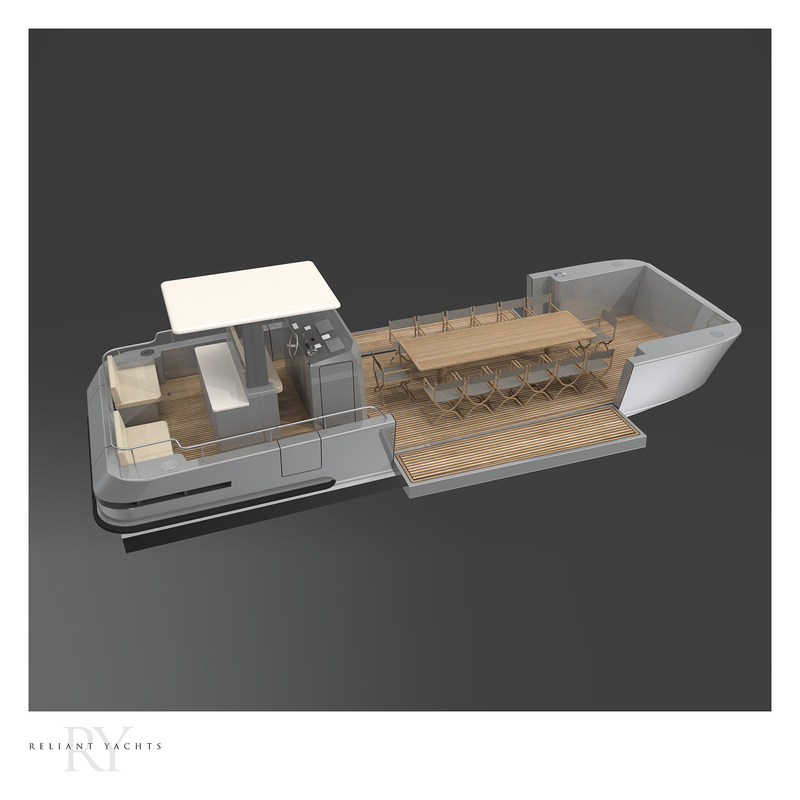 Aft, a galley with large counter will be complete with stove, sink, refrigerator/freezer and dishwasher. The center helm station, on a raised platform to give great site lines, is built into the central cabin, which contains an air-conditioned head to port and a storage area to starboard. If 14 people on a 40-foot boat still sounds cramped, large “wing” doors on the side of the hull power down to extend the floor space and give easy access to the water. In addition to the forward cargo door, an aft swim platform folds down for swim access ­ so you can get to the water from all 4 sides of the boat. Removable davits can be placed to port or starboard to lift gear or supplies when in utility mode. A hard top covers the helm area to keep sun off the helmsman, which powers down to fit nicely into the garage. All the teak decking is synthetic, comfortable under foot and durable under car. The X40L will feature twin Cummins engines and Hamilton jets that will provide speeds in excess of 20 knots. Not a recommended dining speed, mind you. Other features include joy stick control, generator, air conditioning, state-of-the-art entertainment system, power winches, and a Seakeeper stabilizer, added as much to keep the boat perfectly flat at anchor (dinner), as it is for enhancing the ride. More details will be forthcoming throughout the year as the build progresses. For information, contact Reliant Yachts at 401.684.1476 or email us at info@reliantyachts.com.